One of my favorite fruits is dates. There are many different types, of course, but in my mind there are few things that are more of a treat to eat than a date. Last week, Tawn’s boss was in Abu Dhabi for work. When she returned, she gave Tawn this beautiful gift box. Opening the box, we found a kilogram of fresh dates. Fat, plump, sweet dates. What a thoughtful gift. 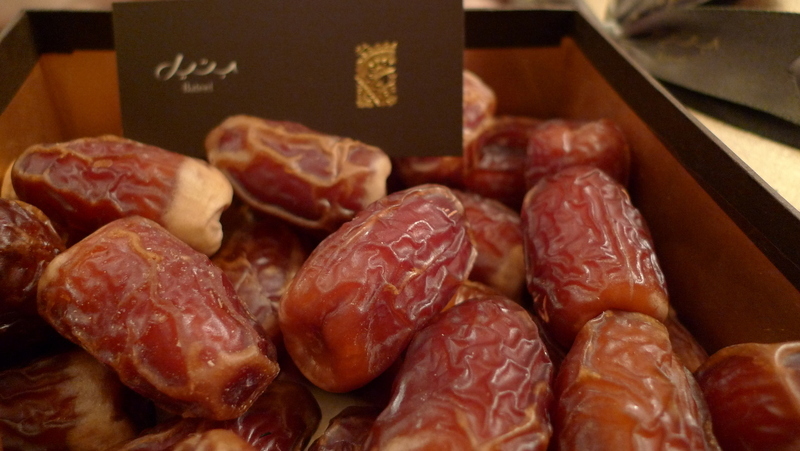 These are segai dates, which often develop a light patch near the top of date and are grown in Saudi Arabia. 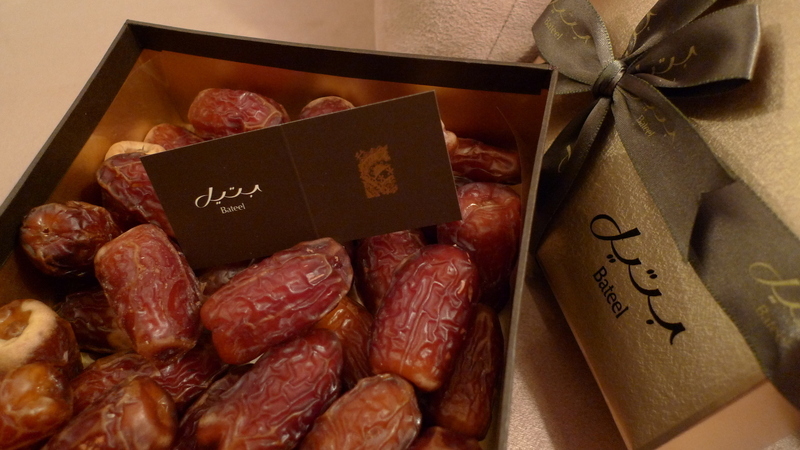 In fact, there are more than two dozen varieties of dates sold by this company, Bateel. My appreciation of dates started in childhood, when during one spring break we drove to Southern California on vacation, spending a day at the Indio Date Festival (now the Riverside County Fair and Date Festival) in Indio, California. Camel races, date shakes, date ice cream, displays on dates – it was a regular date-o-rama. We also drove to Twenty-nine Palms, then down by the Salton Sea, and walked across the border into Tecate, Mexico during the afternoon siesta, then continued to San Diego later in the week. Not many things I remember from the trip, but I do remember the Date Festival! This entry was posted in Uncategorized and tagged Date Festival, Dates, food, Indio by christao408. Bookmark the permalink. I. LOVE. Figs. NOw that is my weakness..Fresh figs off of the tree!! I like dates too. It’s very easily available in most of India. I love figs too!The packaging looks so beautiful (and expensive!). Eat away! I love dates!! I get them whenever I can. Figs too don’t last long in the house. i like dates, but i like figs even more. yum! It has been a long time since I have eaten a date…it just isn’t readily available here in Kansas I guess…lol. But I must admit they DO look yummy!!! Tell me…are there any left or did you and Tawn feast until they were ALL gone??? what a fancy and beautiful box of dates! that’s crazy that they sell two dozen different kinds of dates. i wish they would have a date tasting box where you get a couple of each kind of date to see what the difference is. i love eating dates by themselves, but i’m sure some would be much better for cooking savory and soups, and others much better for dessert! are you going to experiment with these? I like dates too! It reminds me of childhood in China when I used to eat them for snack after school. I have never eaten a date. I have no idea what it would taste like. Redlegsix: COSTCO sells medjool dates during the winter months. We load up when visiting there. These are soft, creamy dates with melt-in-your-mouth sweetness. If you’re not a member, find someone who is to take you in. In the Lenexa store, they are normally found at the edge of the fresh fruit section. Soooo good.Chris, I don’t remember much about that trip either other than the date festival. Wow! I wonder how much they cost?Looks very luxurious with the packaging! Oh! I love dates! We stopped on our trip in CA at a date farm and had date shakes (sooo good)! We keep them in the house most of the time – love the way they remind me of candied sweet potatoes… I had some very fancy ones that were a thank you gift last Christmas. They were so big that eating one was like eating 3 of the regular dates. I think I’ll have to go get a couple for snack! Enjoy (but don’t over do it-hehehe)! I didn’t like dates as a kid. But as I got into my religion I found that they were actually pretty good. “They”…. is so many. This year I went to a date (‘ajwa) factory in Madinah to pick out dates for my mom, it’s all she wanted from my trip. Oh boy was I in for a surprise. It was a relatively small shop but the selection was so vast… packaged, baskets, fresh, etc. my gosh… The dates I carried with me to a college iftar (breakfast, literally the meal we break out fasts with) tonight looked like the ones they were serving, like exactly the same, but the texture, the flavor, everything was entirely different.They are really such incredible fruit, you can run on just a couple for the whole day. Dates remind me of my Grandfather who used to really enjoy them. I never really got into them. Dates as gift? How interesting – these must be very good. Dates ice cream? That sounds interesting (well anything in ice cream sounds interesting – except for stinky tofu and durian). @vsan79 – dates are basically what they call “kurma” in indonesia. it’s available in abundance this time of the year due to “lebaran” season. I also love dates! Ironically, when I read your first sentence my first thought was, “I have a brother-in-law whose favorite dates is fruits!” Not politically correct, but who am I to pass up a joke like that? @rudyhou – Oh, THAT sounds fantastic. I love honey. Date flavoured honey? What could be better? @FewKnew – “Except with the fellas…” Ha ha… you’re funny! @ElusiveWords – Dates are a traditional thing to serve guests or to break the fast during Ramadan. @TheLatinObserver – Interesting how foods can remind us of grandparents. I think of triscuit crackers and liverwurst when I think of my grandfather. It’s a good way to ask someone out w/out worry of being jilted.Would you like a date? No? Well I’m going to have one. LOLSeriously though that date festival sounds like fun! @christao408 – hahaha i don’t know, for some reason my brain connects dates and figs. i guess because they are both somewhat “exotic” fruits that i usually eat rarely, are very sweet, can be expensive, and when i have them they are usually dried. I’ve used dates in cooking, those chopped,dried kind. These you picture outshine any I’ve seen and would love to try one. What a thoughtful gift! During Ramadan, we get our dates from Abu Dhabi or Dubai. We can get them through a wholesaler in Michigan too, but the ones from Saudi Arabia, literally melt in your mouth. I know those boxes. They look great don’t they. That’s all Mohamed wants when I return from Dubai. The varieties that I would see in Mecca and Madinah, filling up the entire store, just blew my mind each time.Have you ever made date sauce to dip your veggies in? Oops. Thought figs were dates until… oh… 2.5 seconds ago. O_o;;; I do believe I had dates once, with goat cheese, and it was absolutely divine! Normally, which kind do you prefer? This might just inspire me to whip up something with dates for Mom. @moolgishin – Medjool (“Madjool”) dates are my favorite variety. Very sweet and moist. @ZSA_MD – Now that you’ve given me the sauce recipe, I’m definitely going to make it. Thank you. @CoweringlilTitmouse – Yeah, the dried, chopped kind is okay for my oatmeal or for cookies, but I’d never eat them straight up. The fresh kind are just amazing. I hope you have the chance to try them. @Texana – You get the prize for funniest answer. @kunhuo42 – That makes sense. Thanks for explaining, Aaron.